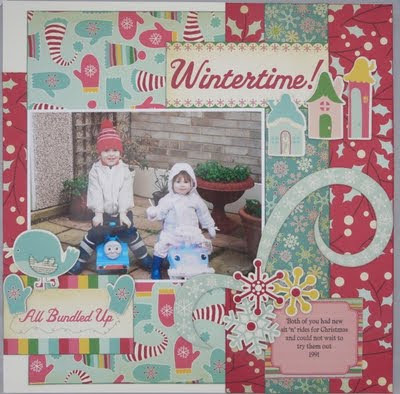 I was asked by Karen to design the 2nd kit for December using the fab papers and chipboard die cuts from Cosmo Crickets range 'Jolly By Golly'. 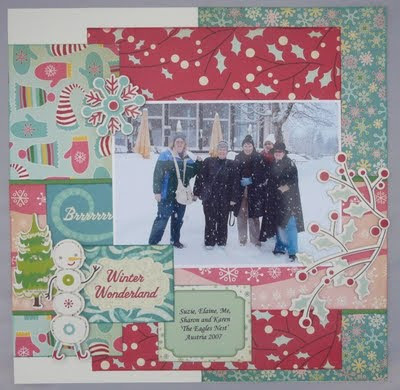 I wanted to use some photos of a holiday I took with friends in Austria just before Christmas 2007 so I used a the snowy theme as against another Christmas one, although there are both on the chipboard sheets. I used Safmat for the journaling, a great product if you like to type your journaling on the computer and then you just peel the backing off and stick down onto some paper and as its transparent you dont see it...I have been using it alot and would recomend it. This second layout is made from the papers etc I had left over from the first layout....makes the kit great value for money. All I added was some more plain cardstock and for the girls who have brought the kit I have used a 7x5 sized photo in both layouts but there is room for you to use 2 smaller 6x4 photos.